Yeah, I found another awesome work from you, like your Mars themed one. ;) It is also good ;) And to me, the church feeling is also here. This is one of the most beautiful Sailor walls if seen so far. The colours are fantastic and I like the way she is moving. i will say this for each wallpaper in this series... well-organized and planned. the way you made them into a stained glass look befittingly is something all of us should be applauding you for. Mercury looks wonderful. I like the aged look you give the glass. Very cool. I wonder, are you going to put all the pics together so they can be view as one? that'd be cool. Awesome idea. :) They look really beautiful giving her a divine aura. Love the serene feeling in it too. I like it how you created a series of walls for Sailor Moon. 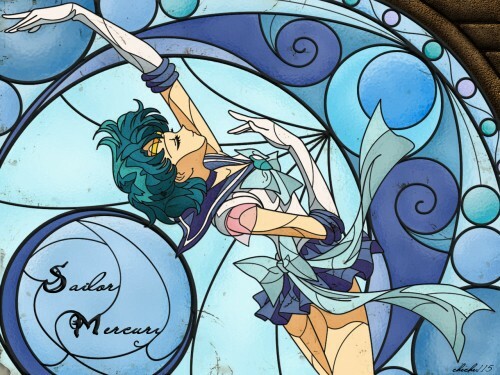 It must be hard to think about a different back for every Senshi. But you did a great job with this. Every wall you did till now is unique and has it own feeling. Maybe you also will make one for my favorite senshi: Sailor Neptune? Would be nice if you made a wall for every of the 10 Senshi. Like I said on Venus I love this wall to. The effect must have been so difficult! You did totally amazing. Wow! very cool idea! Great job! This is simply gorgeous! Thank you. It doesn't give the feel of an old anime/wallie, but rather a tastefully done wallie. Mercury seems to be twirling around the water. It's great. Thank you! thats beautiful!..hope you will be able to do the jupiter art soon!..xxxx. cant wait to see the sailor jupiter artwork!..all your works are cool! Mercury is one of my favorite scouts and I love how your work came out! Very nice. I like your works. They're all amazing.